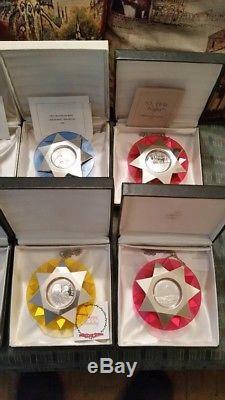 Franklin Mint Christmas Ornaments Sterling Silver LOT of Twelve 1971 to 1985. Each comes in it's original box, and most have the original paperwork. 1971 Silent Night, 1972 The First Noel, 1974 Hark the Herald Angels, 1975 Oh Little Town of Bethlehem, 1976 It Came Upon a Midnight Clear, 1977 Oh Holy Night, 1978 Joy to the World, 1979 We Three Kings, 1980 I Heard the Bells, 1981 Good King Wenceslas, 1983 Away in a Manager and 1985 Silent Night. 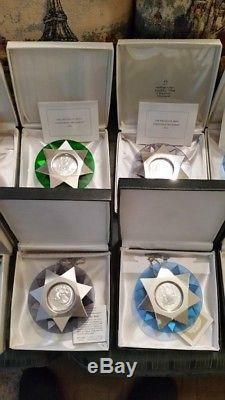 Twelve Sterling Silver Coins from the Franklin Mint in original cases and protective boxes. 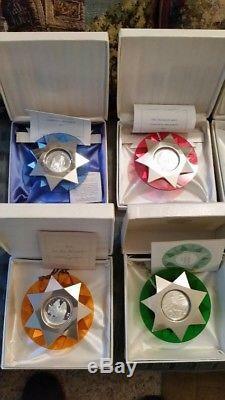 The item "Franklin Mint Christmas Ornaments Sterling Silver LOT of Twelve 1971 to 1985" is in sale since Monday, October 02, 2017. This item is in the category "Collectibles\Holiday & Seasonal\Christmas\ Modern (1946-90)\Ornaments\Other Mod. The seller is "donc2008" and is located in Sparta, Wisconsin. This item can be shipped to United States.